Fiction – hardcover; Bloomsbury Publishing; 320 pages; 2012. Review copy courtesy of the publisher. 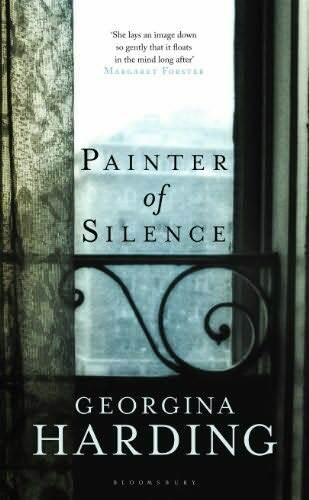 Georgina Harding’s Painter of Silence is one of those books that completely transports you into another world. The elegant language — Harding’s style is restrained but eloquent — and the Eastern European setting gives the novel a dreamlike quality, one that whisks you into another time and place, and then reveals the pain, heartbreak and horror of war in a rather understated but poignant way. This deceptively gentle approach makes the story all the more affecting. I found it a quietly devastating read, one that lingers long after you have (reluctantly) finished it. It is set Iasi, Romania, during the early 1950s. The war might be over, but its effects are still being felt — and the Communists have ushered in a whole new set of fears. Many people are adjusting to the new world order and some are continuing to look for loved ones that disappeared during the conflict. When the book opens we meet Augustin, a rather strange and beguiling character wearing a lice-ridden coat and good military boots, who alights from a train, makes his way across a crowded city — trying not to cough “because he knows it will hurt” — but he carries no identity papers. The next morning he is found on the steps of a hospital. It is clear by the dampness of him that he has spent the night out but it might be anyone’s guess how many previous nights he has spent outdoors. Certainly he does not appear, from the state of him, that he has lived a settled life or even fed regularly for a long time. He is frail as a young bird. […] The first few days they do not even attempt to ask him who he is. For most of the time he is either unconscious or so feverish that they cannot expect to get sense out of him. In his delirium he moans and cries out with strange animal cries, covering taut eyes with hands that seem too big, out of proportion with his emaciated body, scrabbling bone fingers across the sheets. The hospital staff do not realise that Augustin is profoundly deaf — he was born that way — and cannot communicate, although he has a special talent for painting, drawing and creating paper cut-outs (the “Painter of Silence” of the title). He made a special trip to Iasi to track down a childhood friend, Safta, who is now a nurse at the hospital. When Safta discovers Augustin is a patient, she is careful not to reveal to her colleagues that she knows him, because “it would be little help to him and none to herself”. We later discover that she is running away from a past, including a rather privileged background, for reasons of her own. The story charts Augustin’s slow recovery and his subsequent discharge from hospital. We gradually learn about his past, specifically his (almost) idyllic childhood growing up in a manor, owned by Safta’s parents, where his (unmarried) mother was the much-loved cook. We learn how Safta’s mother took Augustin under her wing, almost as if he was one of her own children, and helped to nurture his special talent for art, which flourished with her encouragement. Despite his disability, he was never treated as an outcast, and the way in which Harding details his sibling-like relationship with Safta is probably the most touching aspect of this novel. The pain of him watching Safta’s first fledgling love affair from the sidelines is especially moving, and then the knowledge that he can never leave the estate (because of his deafness) when war breaks out, is heartbreaking. But what is even more heartbreaking — and horrifying — is finding out what happens to him when he stays behind after everyone else has fled. His experiences are revealed slowly via the drawings he makes for Safta. These are beautifully described by Harding — “figures on a road: black rectangles one beside the other like a row of ill-fitting teeth” — and these help bring Augustin’s story to life in a rich, visual way without the need for spoken words. Harding writes beautifully about people and their relationships, and by using Augustin as a silent observer she is able to show the world through a different set of eyes. Ultimately, Painter of Silence is a lovely atmospheric story, tinged by tragedy. It has just been longlisted for this year’s Orange Prize and, if there is any justice in the world, more prize listings will surely follow. This sounds brilliant, Kim, thanks for an enticing review. The author has an affinity for Romania; she apparently rode her motorbike through Hungary and Romania in 1988 and wrote about it in a non-fiction book called In Another Europe. Not sure if you have read any Sandor Marai but she has been compared to him — I can understand why. It’s a really lovely book, Lisa. It’s a very gentle read, but there’s a lot going on “between the lines” as it were that makes it quite an emotional tale. And I love the friendship between the two main characters. I read this last week and thought it was a wonderful read – so glad to see it on the Orange longlist. I’d read ‘The Solitude of Thomas Cave’ a few years ago and loved that one too but somehow (despite having a copy) never got around to ‘The Spy Game’. So it was lovely to be reacquainted with Harding’s writing and be reminded just how good she is. I think you’ve hit the nail on the head with “quietly devestating”, Kim. It starts off so gently and slowly but really works its way under your skin as the story progresses, and some of the imagery is just exquisite. I’m always very much taken with any book about visual artists (since I am one myself) but not all writers pull it off convincingly. Harding does, and the way she uses Augustin’s art as his language and how he struggles to use it to tell a narrative is completely convincing. I loved the part where he realises his simplified figures are too limited to convey what he wants to say, and the needs of the message alter the manner of its delivery. Out of necessity substance wins out over style and forces him to change his ‘voice’ – a conundrum I think most artists (be they painters or writers) face at some point. I did feel that in the last few pages there were too many short scenes one after the other hammering home the same message, and while each one was perfect, all together like that they lacked the subtlety she had displayed throughout the rest of the book, but maybe it was like Augustin drawing the same image (or variations on it) over and over until his meaning could not be mistaken. This is one of the titles on the Orange Prize Longlist that I hadn’t heard of before, but that sound like exactly the kind of book I love. I’m glad to hear you enjoyed reading it. I’m glad to see you enjoyed this one! It’s not out in the U.S. yet, so I’m waiting on my copy to arrive from the UK, but I’m looking forward to it even more now. I was born in Romania, living now in New York, and this is the reason why I am interested in reading Harding’s book. I must confess that I’ve never heard of this writer – and it’s a shame, especially since she’s traveled (rode her motorbike? what a courageous woman!) through Romania and Hungary. But mostly I want to read her book for her style. I liked how you analyzed it. Writing style and well-drawn characters drive my appreciation for a book more than a plot well constructed. Thank you for the review. As always, a pleasure to read your blog. Thanks, Doina. It’s a lovely, restrained book. It’s not published in the USA until September, so you have a bit of a wait, although I think an electronic version is available right now.